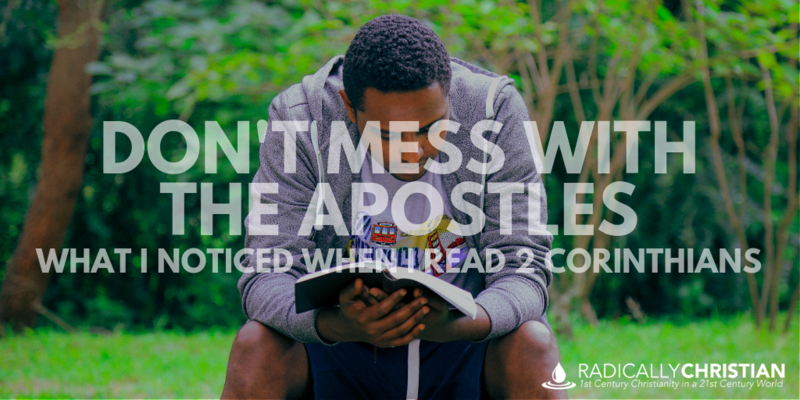 The apostle Paul’s follow-up letter to the church in Corinth starts off very meek and mild. However, in the second half of the letter, his tone changes and he deal directly with the primary problem in Corinth. The primary problem in Corinth is that there are people undermining Paul’s authority and credibility. Second Corinthians is such a relevant book for Christians today because there are still many who undermine Paul’s authority and credibility. His letters are weighty and strong, but his bodily presence was weak, and his speech of no account. He said they were “disguising themselves as apostles of Christ.” Paul begged the Corinthian Christians, whom he loved dearly, not to yoke themselves together with these unbelieving false apostles. He begged the church to make room in their hearts for him. Paul had a special ministry, not because he was smart, not because of his resume, not because of his appearance, not because of his talent or ability. Paul had a special ministry because Jesus commissioned and empowered him. So when Paul boasted of his ministry, he made it clear, his sufficiency was from God, who made him sufficient to be a minister of a new covenant. In the second half of the letter, when Paul was being more direct, he even used the word “boast.” But his boasting centered around what he had suffered for Jesus. He did not boast in his strength but in his weakness. He boasted in the fact that he was constantly persecuted and plagued by a “thorn in the flesh.” However, in all of his suffering, he was sustained by the all-sufficient grace of God. In light of the cross, it isn’t oratory skills or an impressive appearance that proves a person is a servant of Jesus. In the light of the cross, the proof is suffering. And Paul had plenty of suffering to prove he had taken up his cross and was truly a servant of Jesus. There seems to be a thinly veiled threat throughout the letter. Paul wanted the church in Corinth to do the right thing, to be the people Jesus called them to be, and to listen to his teaching. According to the good report Paul received from Titus, there was plenty of reason to believe many of the Corinthians were on the right track, but there was also reason to believe some in Corinth needed to experience spiritual discipline. Paul was afraid when he showed up he would find, “quarreling, jealousy, anger, hostility, slander, gossip, conceit, and disorder.” He was afraid he would find many who sinned earlier had not repented of the “impurity, sexual immorality, and sensuality” they had practiced. He was afraid he would find their promises of financially supporting the church in Jerusalem to be hollow. These fears caused him to delay his personal trip to Corinth and to write this letter warning them about his arrival. This is the third time I am coming to you. Every charge must be established by the evidence of two or three witnesses. I warned those who sinned before and all the others, and I warn them now while absent, as I did when present on my second visit, that if I come again I will not spare them—since you seek proof that Christ is speaking in me. He is not weak in dealing with you, but is powerful among you. For he was crucified in weakness, but lives by the power of God. For we also are weak in him, but in dealing with you we will live with him by the power of God. Paul had King Jesus’ authority to “not spare” the disobedient if he showed up and still found them to be rebellious. Even though he did not want to deal with them harshly, he had the power and the authority to do so. I do not know exactly what this threat means, but no doubt the rebellious would have been kicked out of the church if Paul showed up and they were still continuing in sin. Are YOU Devoted to the Apostles’ Teaching? In all of this, Christians today should remember that our faith is built on the teaching and testimony of the apostles. If we desire to be followers of Jesus, we cannot treat the writings of Paul (or any other apostle) as optional. Jesus was speaking through Paul when he wrote these letters. This is why I get very frustrated when Christians today put more weight and emphasis on the gospel accounts (Matthew, Mark, Luke, and John) than they do on the epistles. Matthew’s testimony about Jesus is not more authoritative than Paul’s. The words Jesus spoke in the flesh are not more important than the words Jesus spoke through his apostle Paul. That’s what “apostleship” is all about. These men were all hand-picked ambassadors of King Jesus. We must devote ourselves to the writings of all the apostles if we wish to understand our King and follow him in a way that pleases and glorifies him.